First prizewinner Christine Rauh, a 25-year-old German student from Hannover, Germany, performs with the Kim Bong-led Ensemble TIMF, in the Isang Yun Competition's final stage, Saturday, in Tongyeong, South Gyeongsang Province. 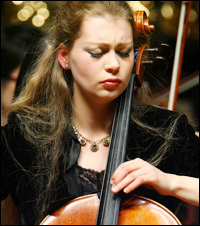 The 2009 Isang Yun Competition wrapped up over the weekend, with a young German cellist winning first prize in the cello section of the annual music event in Tongyeong, South Gyeongsang Province. Hosted by the Tongyeong International Music Festival (TIMF) Foundation, the competition was launched in 2003 to commemorate Yun (1917-95), a celebrated figure in the international avant-garde scene of the mid-20th century. This year 85 young cellists from 26 countries applied, of which 27 from 13 countries were chosen to compete in the late Korean-German composer's hometown. Christine Rauh, a 25-year-old student from Hannover, Germany, beat five finalists by playing the Dvorak concerto with the Kim Bong-led Ensemble TIMF, Saturday. In addition to the $30,000 cash prize, she also took home the Isang Yun Special Prize for her outstanding performance of a piece by Yun. The second place ($20,000) went to Bae Jee-hye, a 21-year-old Seoul National University student; the third prize ($10,000) was given to Matthew Zalkind, 23, from Juilliard, New York; fourth ($7,000) was Georgi Anichenko, a 24-year-old Belarusian studying at the Conservatoire de Paris; and Chang Sung-chan, a 21-year-old Korean student from Juilliard, ranked fifth ($5,000). Chung Yoon-hye, a 19-year-old from the Korea National University of Arts, did not make the finals but won the Seong-yawng Park Special Prize, which is given out to talented young artists in honor of the late head of the Kumho Asiana Group, a supporter of the event. Winners will also fulfill various engagements such as concerts or CD recordings. They will also return to Tongyeong to perform within three years following their wins. ``Winning is not as important as the experience the competition provides. Prizes aren't always determined by talent, and often luck is part of it. Even if you don't win, the competition provides an exposure to the music world that will be greatly beneficial to contestants,'' cellist and jury chairperson Chung Myung-wha told reporters in Seoul, shortly before the competition began on Nov. 14. This year's event invited an impressive group of jury members from different corners of the world, including Chinese virtuoso Jian Wang, Juilliard professor Richard Aaron, Russia's Tchaikovsky Competition winner Karine Georgian, Ko Iwasaki from Japan, Phillipe Muller from the Conservatoire de Paris and prominent Israeli cellist Hillel Zori. ``This is the third edition of the Isang Yun Competition's cello section. In the past seven years, the competition has grown significantly and in particular the cello section is considered one of the leading events of its kind in Asia and in the world,'' said Kim Seung-geun, chairman of the TIMF Foundation. The competition became a member of the World Federation of International Music Competitions in 2006. The Isang Yun Competition rotates between the featured instruments - the piano, cello and violin - each year. The piano section of the completion will take place next year from Oct. 31 to Nov. 7. Meanwhile over 400 items Yun used during his lifetime ― including the cello he played ― arrived in Tongyeong, Yonhap News reported Monday. Yun's daughter Yun-jeong, 60, and a group from Tongyeong City travelled to the late composer's Berlin residence to retrieve the items. The itinerary includes the Korean passport Yun used to travel to Paris in 1956, three perfectly preserved pieces of furniture crafted from Tongyeong wood and a small Korean flag Yun always carried on his keychain. Also returning to Yun's hometown are the Goethe Medal, which he received from the German government in 1995, some 500 photographs as well as his desk and stationary. Original sheet music for Yun's works, including chamber pieces ``Garak'' (1964) and ``Images'' (1969), which are currently stored in a bank safe, will be brought in early next year. The 1988 Mercedes-Benz Yun used until his death in 1995 is also due to arrive. Yun's possessions will be displayed in a music-themed exhibition hall in Docheon Theme Park, Tongyeong, which is slated to open at the end of December. A life-sized model of Yun's Berlin residence will also be built in the hall.